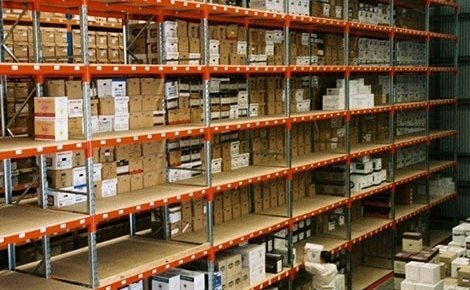 Want a warehouse storage system that keeps stock on continuous rotation? Look no further than our pallet flow rack. 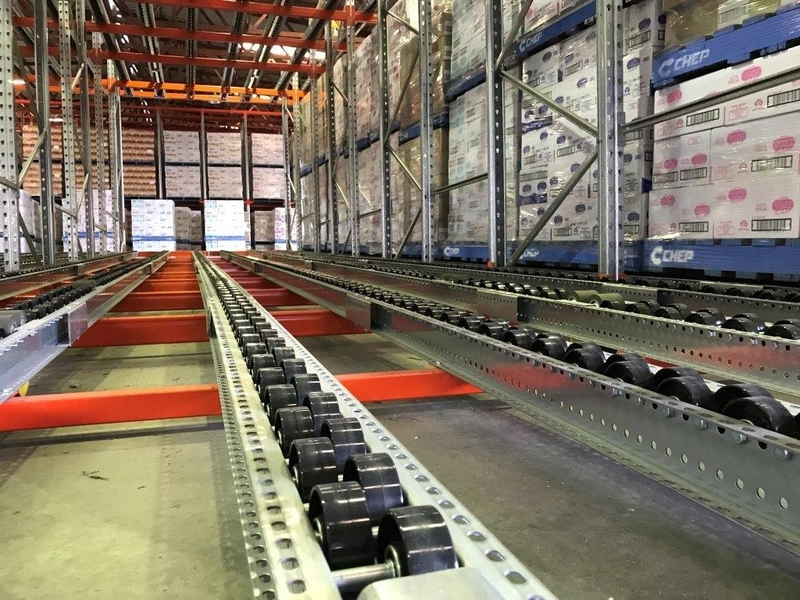 Pallet flow racking is the next step for pallet racking, as pallets are stored on gravity fed roller tracks allowing them to automatically roll down into position. 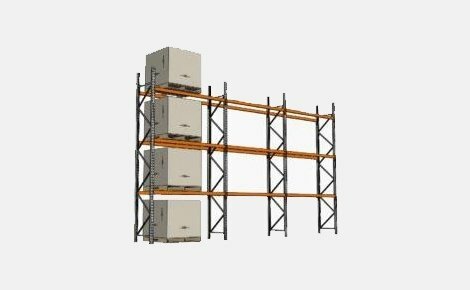 Pallet flow racking is a high density pallet racking system that reduces the need for aisles while maintaining effective product rotation. 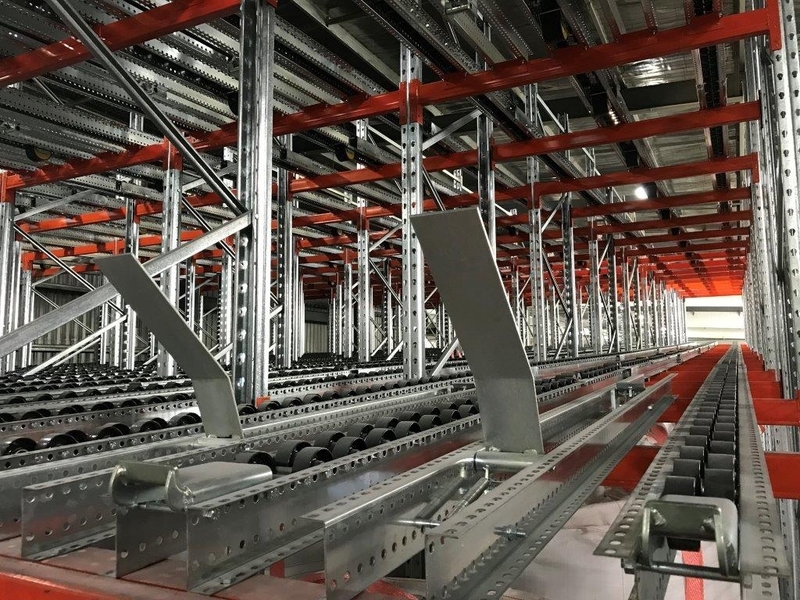 It uses an industrial poly track on incrementally lowered beams in order to automatically rotate products loaded into the back of the system towards the front. 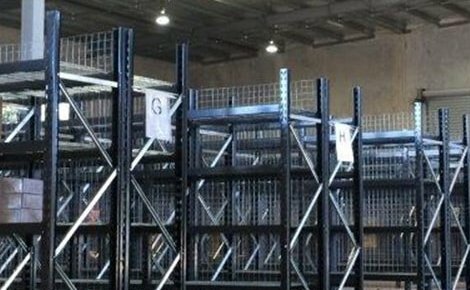 Pallet flow is a FIFO pallet racking system as pallets are loaded into the back of the system and unloaded from the front. This means that the first pallet to be loaded into the back of each lane of the system will also be the first pallet unloaded from the front. 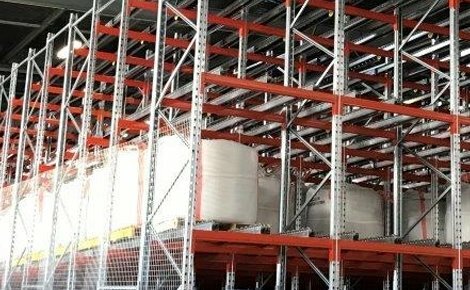 How Does Pallet Flow Racking Work? 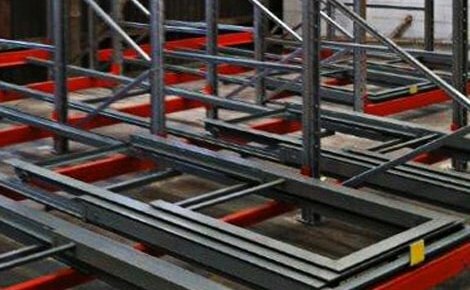 Each beam in a pallet flow rack is installed incrementally higher than the last (from front to back) to form an incline towards the front of the system. An industrial poly track is then installed on top of the beams forming an inclined track on which pallets are stored. As each pallet is loaded into the back of the system the rollers on the poly track, combined with the incline of the beams, allows the pallets to automatically rotate toward to front side of the system. The first pallet loaded into each lane will “flow” right to the front of the system until it reaches the pallet stop. Any pallets loaded after this will flow forward until they reach the pallet in front. However, the second pallet from the front of each lane is caught by a latch in order to protect the front pallet from supporting the weight of every other pallet behind it. When the front pallet is removed from a pallet flow rack, a mechanism is engaged to release the latch holding the second pallet in the lane, allowing it to flow forward to the front of the system. As the remaining pallets in the lane follow suit, the third pallet moves into the second position engaging the safety latch once again. This process continues as new pallets are loaded and unloaded from the system or until the lane is empty. 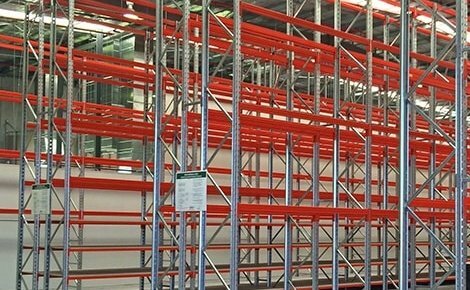 Pallet flow racking is a great way to maximise the storage capacity of your warehouse without compromising on product rotation. 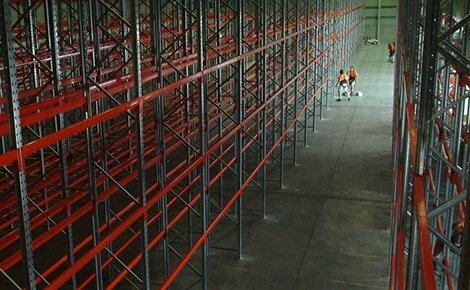 This is because pallet flow racking does not use aisles, as pallets are loaded from one side of the system and unloaded from the other. 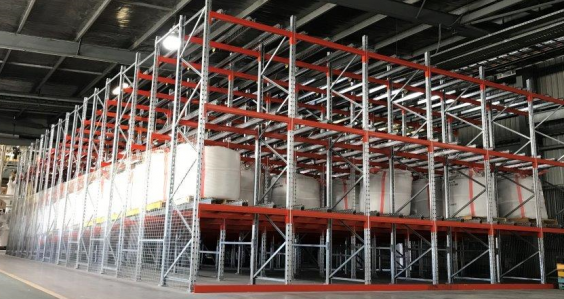 This means that maximum floor space is being used to store pallets rather than having to use potential storage space as aisles. 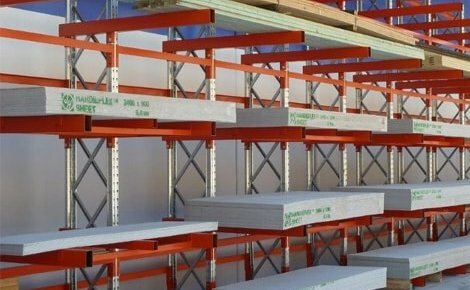 Additionally, pallet flow racking can be designed to fit your space and products with customisable depth, height, and width. 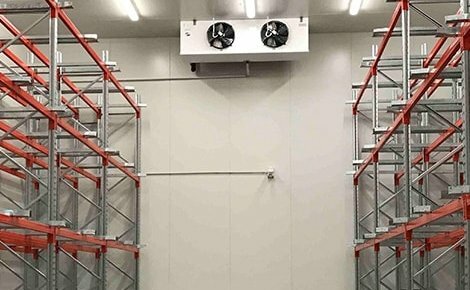 The high density storage of pallet flow racking makes it ideal for use in cold rooms, freezers and other more expensive storage spaces as it can be used to increase the storage capacity of any space while maintaining effective product rotation. 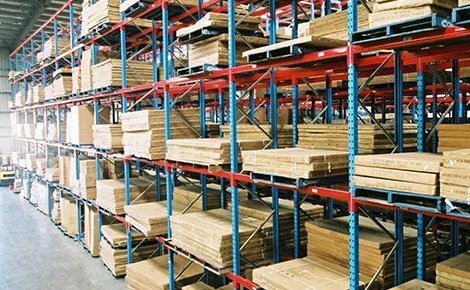 Another advantage of pallet flow racking is that it allows for effective product rotation. 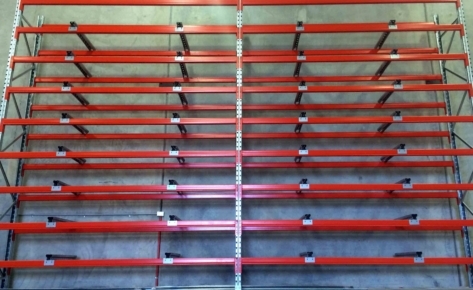 The pallet tracks of a pallet flow racking system are built on an incline towards the front of the system. The inclined tracks, assisted by rollers, allow pallets that are loaded into the back of the system to “flow” forward towards the front. 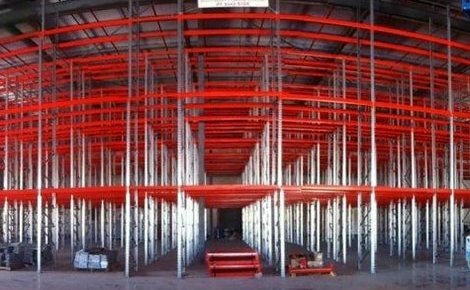 This makes pallet flow racking a FIFO (first in, first out) racking system, meaning that the first pallet to be loaded into each lane is also the first pallet to be removed. 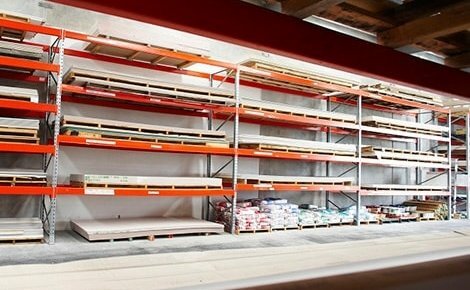 The effective stock rotation of pallet flow racking makes it an ideal system for the storage of perishables and products with a short shelf life. 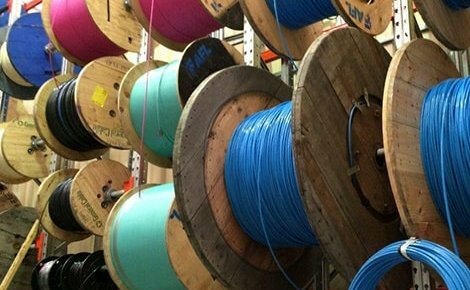 This is because, unlike with other high density systems, you’ll never have to worry about the shelf life of products that have been sitting at the back of the racking, as they are constantly rotated towards the front. 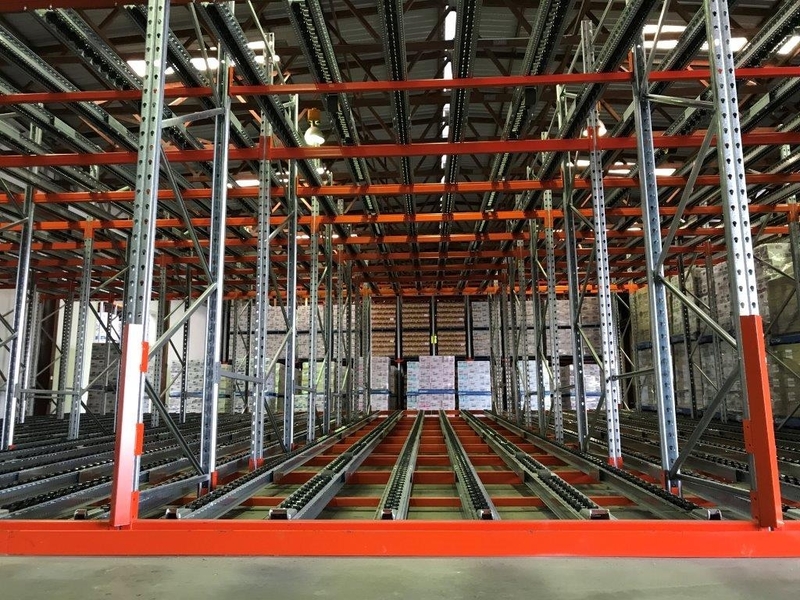 Not only will pallet flow racking save you money by maximising storage capacity in your warehouse, the automatic stock rotation and minimal aisles of a pallet flow system also help to reduce labour hours. This is due to the fact that pallets in a pallet flow rack are automatically rotated as soon as they are loaded into the system, negating the need for the extra man hours involved in rearranging loads. 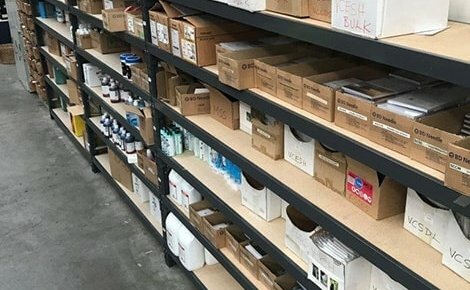 Additionally, with a single aisle for loading and another for unloading, warehouse workers won’t have to travel across the entire warehouse to accurately pick or load products. 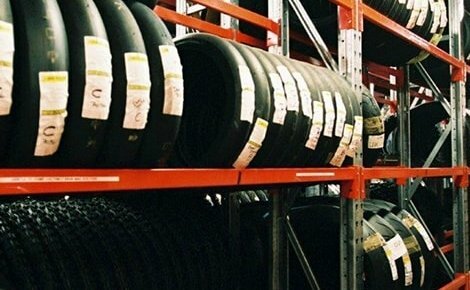 The reduced travel time from using pallet flow racking means less use of forklifts reducing the cost of fuel, maintenance, and repairs. 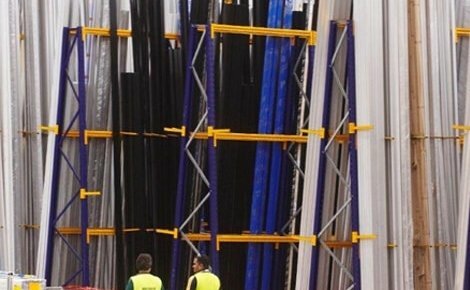 Plus, with only two aisles, traffic flow is more organised reducing the chance of forklift collisions that can cause costly damage to your racking system. 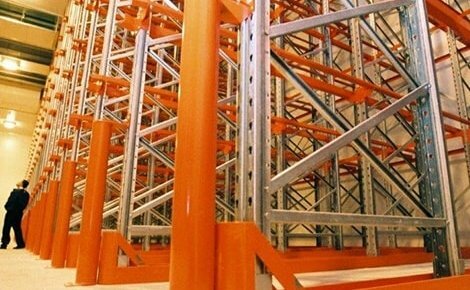 Pallet flow racking also has the advantage of being compatible with a standard forklift. 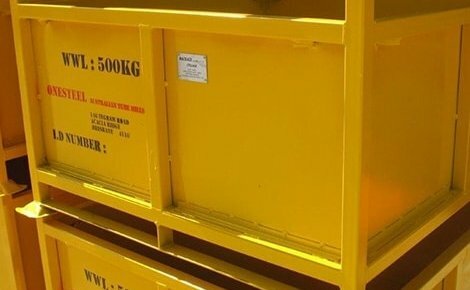 This means that unlike with other high density storage systems such as double deep racking, standard forklifts can be used to effectively load and unload pallets from a pallet flow rack. 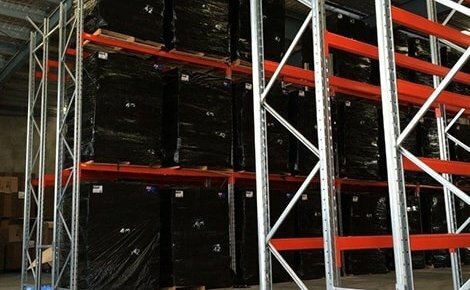 This saves you money as you will not have to replace your existing forklifts or buy attachments in order to fit the style of pallet racking. 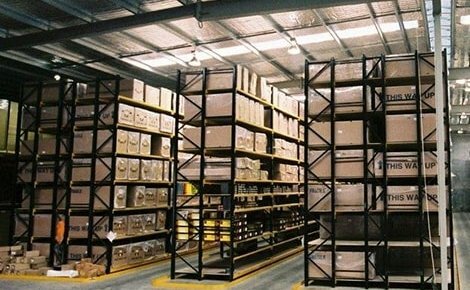 Based in Brisbane, MACRACK design and manufacture high quality pallet racking made to meet and often exceed Australian Standards. 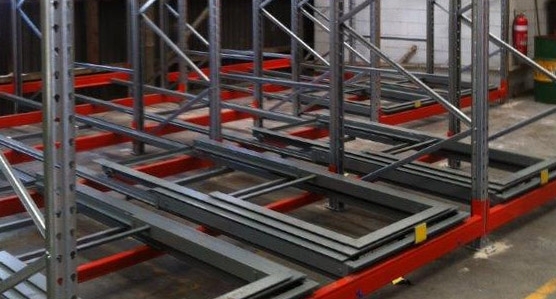 Each racking system we build is made with beams of roll-formed steel and pre galvanised frames that will never rust. 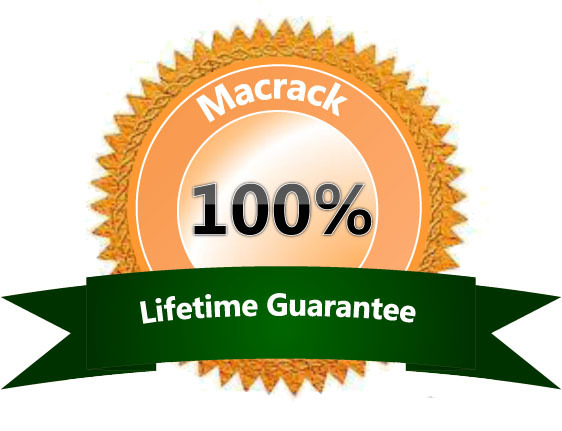 In fact, we are so sure of the quality of our products that every pallet racking system manufactured by MACRACK comes with a lifetime guarantee. 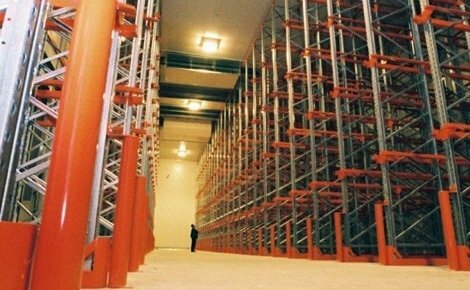 If you’re looking for a high density storage solution with ultimate product rotation then, pallet flow racking could be the answer. 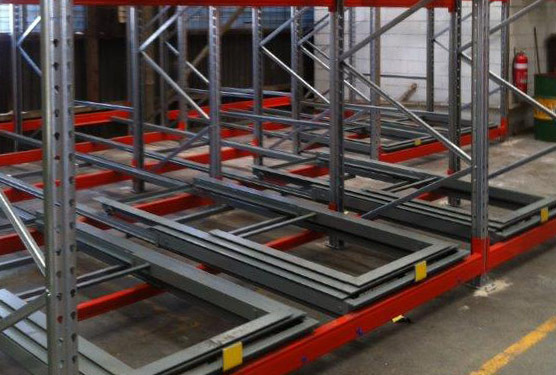 Our pallet flow racking systems are customisable in depth, height, and width, and can be built to fit the design and layout of your warehouse. 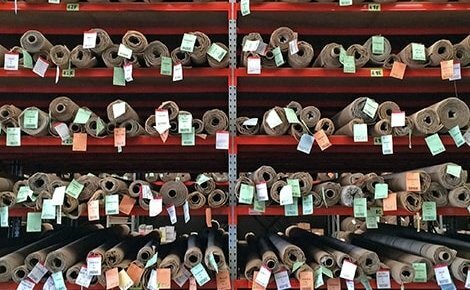 Call MACRACK today on 1800 048 821 for a free warehouse design and expert advice.